There is currently a big difference between what is recommended and what is actually required onboard a superyacht in relation to tenders and toys as the law on superyacht toys is unable to keep up with their development. There are therefore some large grey areas. All drivers of powerboats need to have their Powerboat Level 2 (cost £300). This is required for any boat up to 10m in length. This includes private as well as commercial yachts and is particularly regulated in France, Italy and other popular yachting destinations. All drivers of PWCs (jet-skis and personal water craft) need to have their PWC license (1 day course costing £250). This is required on all commercial vessels but is enforced differently from country to country due to the relative newness of the qualification. This qualification is needed for guests as well as crew who use the watercraft. On all vessels with paid crew operating boats 10-24m in length the crew should have their Yachtmasters or International Certificate of Competence. In order to train guests on charter yachts the RYA offers the opportunity to become an accredited PWC training centre. This means that guests can be trained onboard by instructors prior to using jetskis. For a yacht to gain this accreditation it costs approx. £3000 and is a 4 day course for up to 6 people. Qualified instructors onboard are then able to offer guests a short course (usually a 30-45 minute introductory course) and on gaining their completion certificate guests can then use the PWC’s. No license is required to operate Seabobs, inflatable floats, slides and Jetsurfs. However, careful selection of their operating area needs to be made. 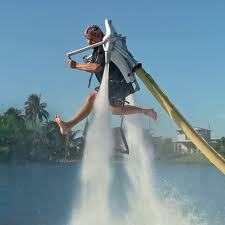 Increasingly manufacturers are insisting on training on delivery of the more complex yacht toys (e.g. Jetsurf, Jetlev-Flyer, Submarines etc.) by the manufacturer. This is required in order to activate the warranty and is highly recommended in order to use them to their full potential. Josh Richardson is the managing director of Superyacht Tenders and Toys, a one stop shop for all your yacht tender and yacht toy needs. 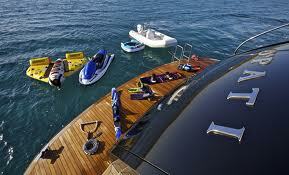 Areas of expertise include new build production and custom tenders, chase boats, RIBs, plus popular yacht toys such as the Jetsurf, Seabob, Inflatables, Yacht Slides, Jetlev-Flyer, Submarines and all Watersports gear. Give us your requirements, size, type, budget and location and we will provide you with all options available, all at the best price. Superyacht Tenders and Toys is able to assist with the consultancy, purchase, rental and support of all aspects of tender and toy ownership servicing the worlds finest yachts and backing this up with excellent after-sales support. The U.K.-based company also has offices in Cannes and Fort Lauderdale.